Human eye cross-sectional view. Courtesy NIH National Eye Institute. Many animals have eyes different from the human eye. The retina is a thin layer of neural cells that lines the back of the eyeball of vertebrates and some cephalopods. In vertebrate embryonic development, the retina and the optic nerve originate as outgrowths of the developing brain. Hence, the retina is part of the central nervous system (CNS). It is the only part of the CNS that can be imaged directly. The vertebrate retina contains photoreceptor cells ( rods and cones) that respond to light; the resulting neural signals then undergo complex processing by other neurons of the retina. The retinal output takes the form of action potentials in retinal ganglion cells whose axons form the optic nerve. Several important features of visual perception can be traced to the retinal encoding and processing of light. The unique structure of the blood vessels in the retina has been used for biometric identification. 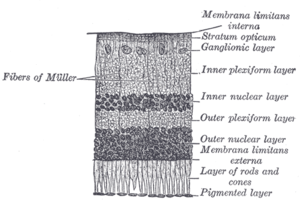 Ganglion cell layer - Layer that contains nuclei of ganglion cells and gives rise to optic nerve fibers. Outer plexiform layer - In the macular region, this is known as the Fibre layer of Henle. External limiting membrane - Layer that separates the inner segment portions of the photoreceptors from their cell nuclei. In adult humans the entire retina is 72% of a sphere about 22 mm in diameter. At the centre of the retina is the optic disc, sometimes known as "the blind spot" because it lacks photoreceptors. It appears as an oval white area of 3 mm². Temporal (in the direction of the temples) to this disc is the macula. At its centre is the fovea, a pit that is most sensitive to light and is responsible for our sharp central vision. Human and non-human primates possess one fovea as opposed to certain bird species such as hawks who actually are bifoviate and dogs and cats who possess no fovea but a central band known as the visual streak. Around the fovea extends the central retina for about 6 mm and then the peripheral retina. The edge of the retina is defined by the ora serrata. The length from one ora to the other (or macula), the most sensitive area along the horizontal meridian is about 3.2 mm. In section the retina is no more than 0.5 mm thick. It has three layers of nerve cells and two of synapses. The optic nerve carries the ganglion cell axons to the brain and the blood vessels that open into the retina. As a byproduct of evolution, the ganglion cells lie innermost in the retina while the photoreceptive cells lie outermost. Because of this arrangement, light must first pass through the thickness of the retina before reaching the rods and cones. However it does not pass through the epithelium or the choroid (both of which are opaque). Between the ganglion cell layer and the rods and cones there are two layers of neuropils where synaptic contacts are made. The neuropil layers are the outer plexiform layer and the inner plexiform layer. In the outer the rod and cones connect to the vertically running bipolar cells and the horizontally oriented horizontal cells connect to ganglion cells. The central retina is cone-dominated and the peripheral retina is rod-dominated. In total there are about seven million cones and a hundred million rods. At the centre of the macula is the foveal pit where the cones are smallest and in a hexagonal mosaic, the most efficient and highest density. Below the pit the other retina layers are displaced, before building up along the foveal slope until the rim of the fovea or parafovea which is the thickest portion of the retina. The macula has a yellow pigmentation from screening pigments and is known as the macula lutea. The vertebrate retina is inverted in the sense that the light sensing cells sit at the back side of the retina, so that light has to pass through a layer of neurons before it reaches the photoreceptors. By contrast, the cephalopod retina is everted: the photoreceptors are located at the front side of the retina, with processing neurons behind them. Because of this, cephalopods do not have a blind spot. The cephalopod retina does not originate as an outgrowth of the brain, as the vertebrate one does. This shows that vertebrate and cephalopod eyes are not homologous but have evolved separately. The cones respond to bright light and mediate high-resolution vision and colour vision. The rods respond to dim light and mediate lower-resolution, black-and-white, night vision. It is a lack of cones sensitive to red, blue, or green light that causes individuals to have deficiencies in colour vision or various kinds of colour blindness. Humans and old world monkeys have three different types of cones ( trichromatic vision) while other mammals lack cones with red sensitive pigment and therefore have poorer (dichromatic) colour vision. When light falls on a receptor it sends a proportional response synaptically to bipolar cells which in turn signal the retinal ganglion cells. The receptors are also 'cross-linked' by horizontal cells and amacrine cells, which modify the synaptic signal before the ganglion cells. Rod and cone signals are intermixed and combine, although rods are mostly active in very poorly lit conditions and saturate in broad daylight, while cones function in brighter lighting because they are not sensitive enough to work at very low light levels. Despite the fact that all are nerve cells, only the retinal ganglion cells and few amacrine cells create action potentials. In the photoreceptors, exposure to light hyperpolarizes the membrane in a series of graded shifts. The outer cell segment contains a photopigment. Inside the cell the normal levels of cGMP keeps the Na channel open and in thus in the resting state the cell is depolarised. The photon causes the retinal bound to the receptor protien to isomerise to trans-retinal. This causes receptor to activate multiple G-proteins. This inturn causes the Ga-subunit of the protein to bind and degrade cGMP inside the cell which then cannot bind to the CNG Na channels. Thus the cell is hyperpolarised. The amount of neurotransmitter released is reduced in bright light and increases as light levels fall. The actual photopigment is bleached away in bright light and only replaced as a chemical process, so in a transition from bright light to darkness the eye can take up to thirty minutes to reach full sensitivity (see dark adaptation). In the retinal ganglion cells there are two types of response, depending on the receptive field of the cell. The receptive fields of retinal ganglion cells comprise a central approximately circular area, where light has one effect on the firing of the cell, and an annular surround, where light has the opposite effect on the firing of the cell. In ON cells, an increment in light intensity in the centre of the receptive field causes the firing rate to increase. In OFF cells, it makes it decrease. Beyond this simple difference ganglion cells are also differentiated by chromatic sensitivity and the type of spatial summation. Cells showing linear spatial summation are termed X cells (also called "parvocellular", "P", or "midget" ganglion cells), and those showing non-linear summation are Y cells (also called "magnocellular, "M", or "parasol" retinal ganglion cells), although the correspondence between X and Y cells (in the cat retina) and P and M cells (in the primate retina) is not as simple as it once seemed. In the transfer of signal to the brain, the visual pathway, the retina is vertically divided in two, a temporal half and a nasal half. The axons from the nasal half cross the brain at the optic chiasma to join with axons from the temporal half of the other eye before passing into the lateral geniculate body. Although there are more than 130 million retinal receptors, there are only approximately 1.2 million fibres (axons) in the optic nerve so a large amount of pre-processing is performed within the retina. The fovea produces the most accurate information. Despite occupying about 0.01% of the visual field (less than 2° of visual angle), about 10% of axons in the optic nerve are devoted to the fovea. The resolution limit of the fovea has been determined at around 10,000 points. The information capacity is estimated at 500,000 bits per second (for more information on bits, see information theory) without colour or around 600,000 bits per second including colour. Retinitis pigmentosa is a genetic disease that affects the retina and causes the loss of peripheral vision. 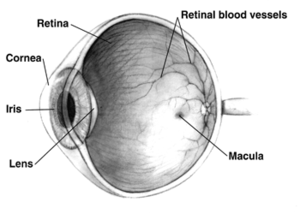 In retinal separation, the retina detaches from the back of the eyeball. Ignipuncture is an outdated treatment method. A number of different instruments are available for the diagnosis of diseases and disorders affecting the retina. An ophthalmoscope is used to examine the retina. Recently, adaptive optics has been used to image individual rods and cones in the living human retina. The electroretinogram is used to measure non-invasively the retina's electrical activity, which is affected by certain diseases. A relatively new technology, now becoming widely available, is optical coherence tomography (OCT). This non-invasive technique allows one to obtain a 3D volumetric or high resolution cross-sectional tomogram of the retinal fine structure with histologic-quality. Treatment depends upon the nature of the disease or disorder. Transplantation of retinas has been attempted, but without much success. At MIT and the University of New South Wales, an "artificial retina" is under development: an implant which will bypass the photoreceptors of the retina and stimulate the attached nerve cells directly, with signals from a digital camera. George Wald, Haldan Keffer Hartline and Ragnar Granit won the 1967 Nobel Prize in Physiology or Medicine for their scientific research on the retina. A recent University of Pennsylvania study calculated the approximate bandwidth of human retinas is 8.75 megabits per second, whereas a guinea pig retinas transfer at 875 kilobits.